"putting the meal on the map"
Each year we have a holiday tradition (adopted from Gwen’s Santa Fe family heritage) of preparing posole rojo – the classic Mexican (and New Mexican) stew of “nixtamalized” corn cooked in bone broth with chili and other spices. With the exception of the pork (brought by the Spanish), this is a dish that might have been enjoyed all the way back to Mayan (and pre-Incan in the Andes) times. 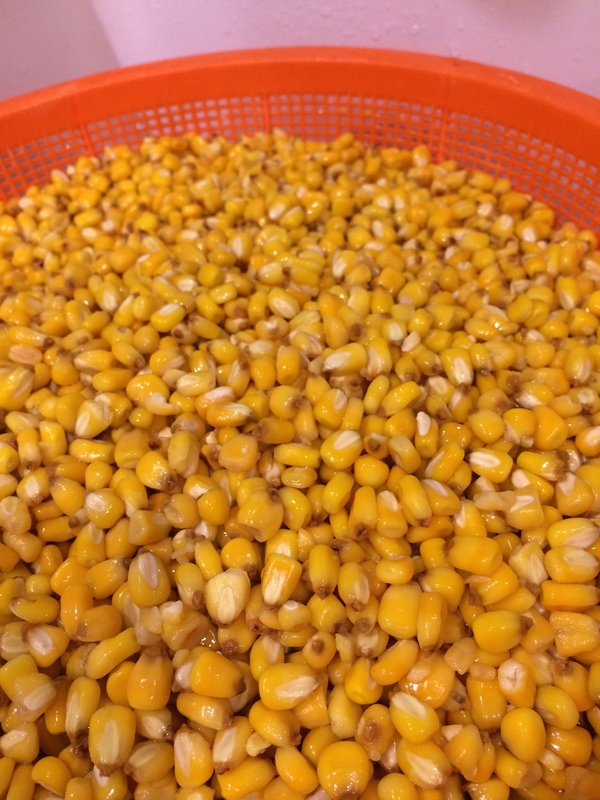 The word “nixtamalizado” (Spanish) or “nixtamalized” is derived from the Aztec language and refers to soaking corn in an alkali solution to remove the pericarp (outer covering). In addition to aiding the speed of cooking, this process also has the happy effect of dramatically increasing the availability of niacin and boosting corn flavor. This is also the process for making masa for tortillas and tamales (nixTAMALi). Typically I buy the posole corn “prepared” – meaning that it has been nixtamalized somewhere else and then re-dried for sale. Gwen’s grandparents bought theirs from Casados Farms – a northern New Mexico institution and home of the distinct El Guique chili pepper. I can still get products from Casados Farms (a phone call to the Portrero Trading Post) but this year I wanted to try the nixtalization process from scratch. So I ordered up a 20# bag of organic yellow corn from Great River Organic Milling in Wisconsin. (A bit out of my foodshed, but organic field corn is surprisingly rare in the pinot-saturated Russian River Valley…). You can get the basic idea about the nixtamal process from a CIA instructional vid here. The corn turns a vibrant golden color in the calcium hydroxide (I used “mrs.wages” pickling lime) – which looks very cool. 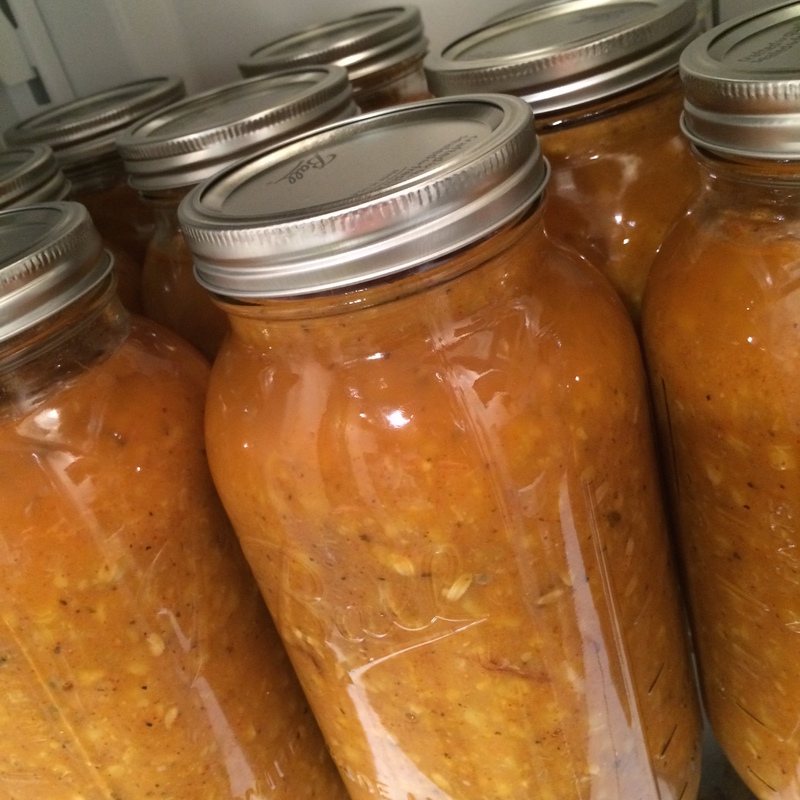 Once the corn was cooling in its alkali soup (I soaked mine all night) I turned to the pork stock. 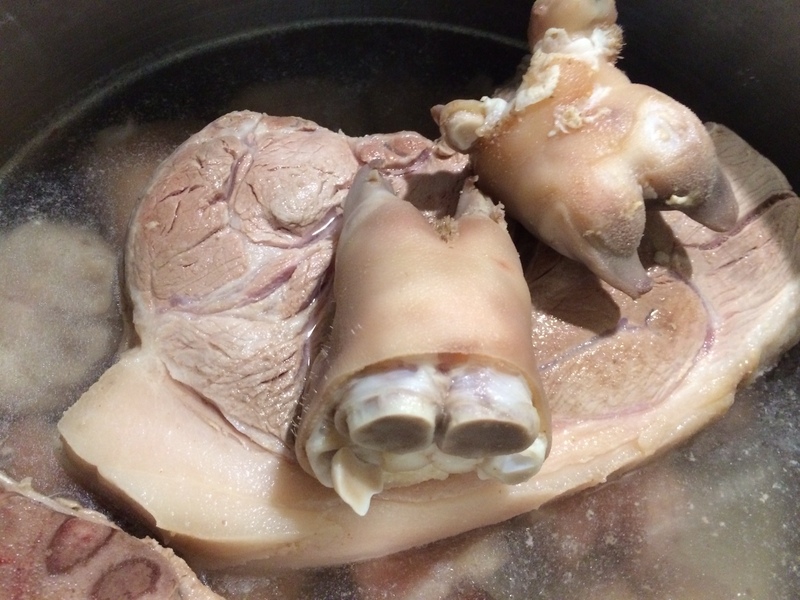 Nearly all posole recipes seem to utilize trotters (pigs feet). Fortunately we have a great butcher shop – Sonoma County Meat Co. – that sells locally raised, pastured pork. (The more I learn about CAFO-based meat production the more I want to know where my meats actually come from.) Trotters are cheap and create a stock that is rich and full of body. I also added some pork shoulder for shredding into the finished posole. Some folks add LOTS of pork, but I like to let the corn be the star. After simmering my freshly made posole in the strained stock I added lots of garlic, onion, Mexican oregano (a member of the verbena family), the shredded pork and of course – red chili. There are many ways of getting the chili into to stew but I had some incredible heirloom red chili from Chimayo, New Mexico, so that’s what I used. Posole takes plenty of salt – and I found that my homemade posole corn had a touch of sweetness. One of the best parts about posole is the fresh garnishes – cabbage, radish, cilantro, a squeeze of fresh lime – all are great. Plus, there should be a dish of good ground red chili to sprinkle in for extra chili flavor and kick. Buen Provecho! This entry was posted in Andean Foodways, GeoKitchen Posts on January 3, 2016 by garyfleener. Now we’re talking Aunt Suzan SOUL food….Yeah Buddy! This is a tradition that I love but did not accomplish this year. Yours looks amazing! Very interesting stuff that I did not know about this special soup. Thanks for sharing. Wow Gary! I love Posole. I always have used canned hominy. I am impressed that you did yours from scratch. And I love Chimayo chile. I will have to try it in my broth.